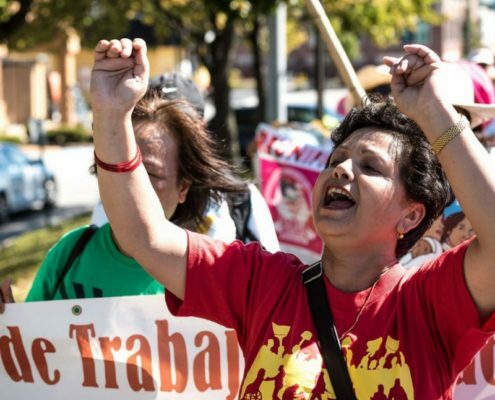 Informed by the Catholic social tradition of justice for workers, faculty and staff at the three Jesuit universities within the California Province have signed a letter in support of the California Domestic Worker Bill of Rights. Nike, the world's largest supplier of athletic shoes, apparel, and other sports equipment, has announced that it will no longer allow the Workers Rights Consortium access to its collegiate factories for the purpose of assessing compliance with university labor codes. You don’t have to fully support their goals to realize that a resurgent labor movement is a good thing — a counterbalance to increasingly monolithic corporate powerhouses and a mediating institution for a seemingly voracious public sector. Justice — for janitors, chefs, teachers, sales clerks, or, yes, factory workers — is an important element, a constituent element of a just public order. And, in many ways, the current climate seems to ignore this.